ABP’s network of five ports in South Wales handled 12.5 million tonnes of cargo in 2017 thanks to major investment in infrastructure and an ongoing commitment to delivering the highest standards of customer service. 12.5 million tonnes of cargo were handled at Newport, Cardiff, Barry, Port Talbot and Swansea with strong growth seen in both traditional and emerging sectors, serving South Wales and the wider UK economy. Year-on-year growth was seen in several commodities including fertiliser to support the agriculture sector and aggregates for manufacturing which both saw 14% growth up on 2016, whilst animal feed leapt by some 54%. Recyclables increased by 72% and scrap metal, both exports and imports, doubled in volume compared to the previous year, registering a rise of 108%. ABP South Wales Director, Matthew Kennerley, said: “Our five ports are continuing to see strong growth thanks to the investment we have been delivering in enhanced infrastructure and facilities. This has helped both new and longstanding customers to further develop and grow their businesses. “Our ports in South Wales are vital strategic assets of national importance. Strong growth across our ports is not just success for ABP and our customers, it’s success for the Welsh economy. ABP South Wales welcomed several new businesses to their ports throughout 2017. Notably, in September 2017, Swansea Dry Docks Ltd (SDL) reopened the Swansea’s drydock facilities on a long term lease and welcomed its first vessel following an extensive upgrade of facilities. This long term commitment by SDL will provide a boost to the local economy in terms of skilled employment and increased demand for specialist materials and services. 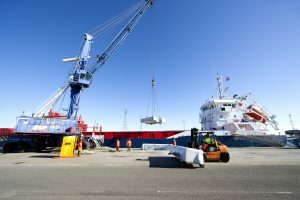 The growth seen in the handling of project cargo in 2016 was built upon in 2017 as the port of Swansea continued to support the renewable energy sector by handling wind turbine components for local projects. The port handled all components for the Brechfa Forest Wind Farm project, a 28 turbine project based in Carmarthenshire. Investments were also made into key pieces of infrastructure to ensure the future stability of ABP’s South Wales ports and the surrounding area. In August 2017, the refurbishment of Green Park in Port Talbot was completed. This 18 month major renovation project represents an investment of £2.7 million by ABP South Wales. It will provide huge benefits to the River Afan in terms of improved water management and increased water security for TATA’s Port Talbot steel works.